Many people take astrology seriously and watch daily horoscope shows aired on local news channels. Despite the fact that predictions from the TV astrologers are not always correct, people will watch the show before they leave for work. The Newspaper’s in some countries have a special section for daily predictions. A renowned astrologer publishes this column. It’s the favorite part of many spiritual people. Frankly speaking, users don’t have to glue their eyes to the television set nor do they’ve to buy a newspaper to know horoscope for their zodiac sign. Smartphones launched these days have powerful hardware. Thus, they can handle any complex applications. Some developers have published Horoscope apps for Android as well as the IOS OS. Hence, you don’t have to pay a visit to a palmist, numerologist or an astrologer to know your daily or monthly prediction. If you believe in astrology, install any one of top horoscope apps we’ve covered below and use them. DH is the most popular and the best horoscope app for Android. Used by 10 million people, DH allows you to change the font size, color theme, etc. The app features horoscope matching module. It lets users set reminders. With this app, you can calculate Druid sign and view prediction for the same. It has a module to see yearly, daily and Chinese horoscopes. DH app will never detect your location. It requires 9 megabytes free space for installation. HFB is a free Facebook app that automatically detects your zodiac sign from the birth date. You can configure it to post horoscopes daily on your timeline and in your news feed. You’re allowed to rate the prediction. If you think that the prediction is accurate or useful, click on the like button else ignore it. This app has more than 20 million active users. Ziggler’s application is compatible with all versions of the Android operating system. This free app has an average rating of 4.1 from 28K users on the Play Store. Its users will get daily horoscope predictions through Android’s notification system. You can change notification time or the zodiac sign anytime by navigation to settings. 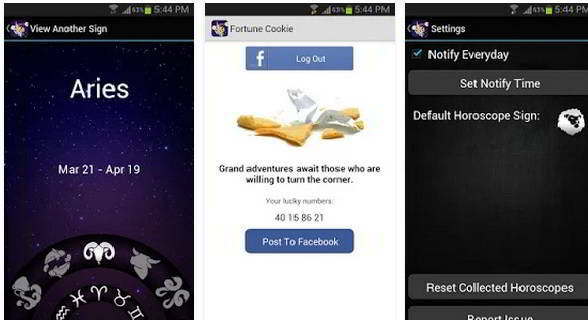 To get the fortune cookie, you’ll have to log in to your FB account. Users are allowed to share the prediction on their Facebook timeline. Horoscopes are stored offline. Thus, you can go through your previous predictions. 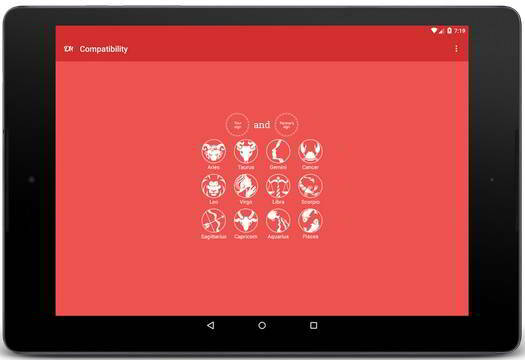 The Astrosage application is bundled with plenty of useful tools like the birth chart, Kundli, Lal Kitab and Panchang generators. It includes a utility to view life, monthly and daily horoscope predictions. To create a chart, users should enter their name, date and birth, time and place. You can save the charts on your device in PDF format. You don’t have to be an astrology expert to use Astrosage. To install this app, you should have a phone or tablet with Android Gingerbread and higher OS. Astrosage supports Hindi as well as the English language. Its download size (APK) is 5 MB. Note: Many developers have published horoscope apps without taking inputs from Astrologers. You should not use such apps as they can be misleading.